Vertagear Triigger 275 ▷ Size & Buying Guide on GOTURBACK.UK! The Vertagear Triigger 275 is part of the Trigger series, the 275 however is a slightly cheaper version of the 350/SE. It is constructed using an aluminum frame and base, which differs from the 350/SE’s steel frame. It is essentially a premium chair with fewer features than more expensive models, crafted from cheaper materials. PU leather is used on the armrests, with calf grain genuine leather used on other areas of the seat. The 275 does not give the full premium feel of the higher end model but is still a great chair. It’s ideal for those looking to upgrade their current chair without paying above the odds. It is aimed at serious gamers that are seeking comfort and quality at a mid-range price. It is a well crafted and stylish looking chair that comes in a range of colors, with a good number of adjustable components. The Triigger 275 has most of the features you can find in higher end gaming chairs. It does not, however, come with 4D armrests and instead includes 2D armrests that offer two directional adjustabilities. These are great but do not offer as many options as the 4D armrests included on the Triigger 350/SE. The back of the chair contains a breathable mesh that is height adjustable. The chair has a weight limit of 150Kg which is much less than found in more expensive models, so it may not be suitable for heavier gamers. Gamers should familiarize themselves with the weight limit to ensure suitability. The chair does, however, have a wider seat with a width of just over 50cm. The depth of the seat can also be adjusted back and forward to provide a depth between 50 and 54cm. Like the more expensive version of the Triigger, the chair does have a reclining ability. This allows users to lock the chair’s angle in 22 different positions with a 15-degree recline. 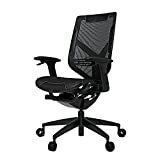 This means it’s a good option for gamers looking for a chair with many adjustable components. There are no neck or lumbar pillows provided on the Triigger 275 or the more expensive model, so gamers that see this as an essential feature may not be too impressed. The casters on the chair are good for gamers with wooden flooring as they provide soft and smooth sliding, they may need to be replaced down the line, however. The main system of the chair is powered by steel cables which are very hard wearing and should last for years. Like most gaming chairs, the Triigger 275 incorporates a class 4 gas lift for quick height adjustments when gaming. The Triigger 275 comes in four colours that should fit most environments including red, white, blue, and black. The chair does not come in these colours as solid colours, the colour options are simply for added effect on a black base. This means the colours will only add a bit of life to the main black design of the chair. The chair does not come with any additional accessories, and accessories like headrests are only available on more expensive models. This chair is suitable for most gamers of average size. The weight limit at 150KG is high but not as generous as others on the market. The main seat width is relatively generous, however, at just over 50cm. Although some larger gamers may be able to fit quite comfortably in the Triigger 275, it is not as heavy duty as other chairs out there. Taller gamers should be fairly comfortable in the Triigger providing they do not exceed a height of 190cm. Premium Calfskin Leather - Exquisitley handcrafted calfskin leather combines skilled craftsmanship with advanced design, cutting and stiching techniques. The incredibly fine grain leather has a smooth, luxurious texture, creating extra comfort without sacrificing durability. Reinforced DuPont TPEE Mesh - Quality textile banded with the finest DuPont TPEE causes the mesh to withstand high-temperatures and heavy hydraulic movement, optimal for long hours of use and breathability. The elastomer in the DuPont TPEE helps it to keep its shape and prolongs the life span of the mesh. Triiger Height Adjust - Trigger chairs allow users to adjust seating positions as fast as 0.32 seconds. Triiger Recline Angle Adjust and Lock - The back of Triiger chairs can recline 33 degrees and be locked in to 22 different positions, letting you find the most comfortable position for you. Height Adjustable Lumbar Support - The built-in lumbar support on the Triiger 275 is height adjustable. In combination with the back support, it can provide the ideal support for your back.